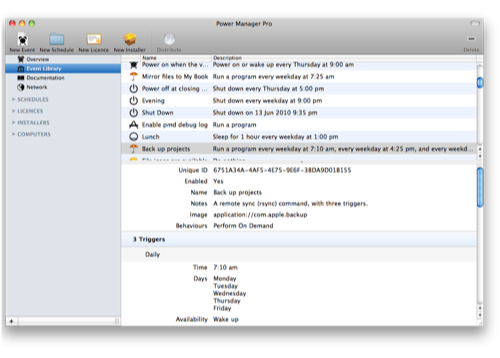 Professional provides a single location for storing all of your Power Manager resources. These resources include events, schedules, licence groups, and installers. Finally deploy to your computers. Once you have worked through this workflow once, you can freely switch between the resources making changes as needed. It helps to have a plan of what you want to achieve in terms of energy saving and automation with your Macs. You do not need to create the ideal schedule first time. Professional and Power Manager are designed to allow incremental updates and changes to your events and schedule over time. Take a look at the Power Manager User Guide for inspiration on how to create an energy saving schedule suitable for your environment. Start with a small collection of energy saving events. With these events in schedules and deployed, move on to creating and adding more sophisticated events. Event Library shows all the events available to Professional. All events created with, or imported into, Professional appear in Event Library. If you remove an event from the Event Library, the event will be removed from all schedules that include it. Select the menu item: File > New > New Event…. Select the menu item: File > Open…. Choose the event to import to open the event in an editor. Click the Import button to import to Event Library. Double-click on the event to export. Select the menu item: File > Save As…. Select the event to remove.